Sand dunes are so much fun to photograph. They’re full of interesting lines, shapes, curves, and textures – almost as if they were sculpted for photographers. And they keep changing. Every big windstorm reshapes the dunes, creating new possibilities. So when Claudia and I traveled to Death Valley last month to photograph the lunar eclipse, I had to make a couple of trips to the dunes during the day as well, just to fill my eyes and viewfinder with all that abstract beauty. 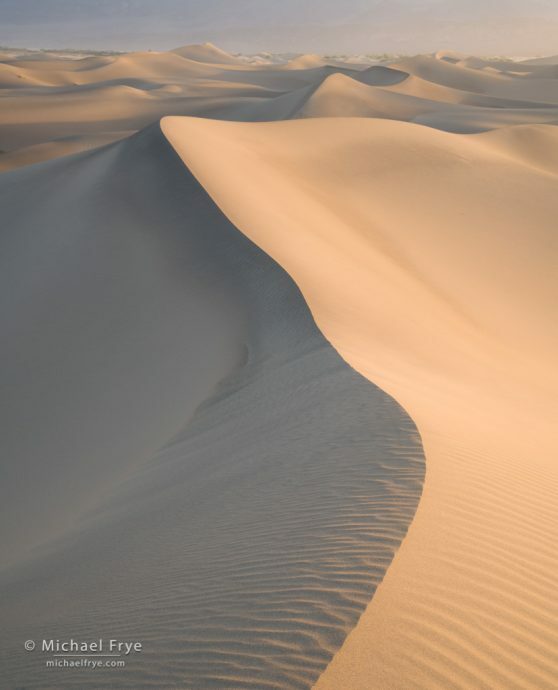 Dunes are great compositional training grounds. In the dunes, you can’t just find an interesting subject and point your camera at it. 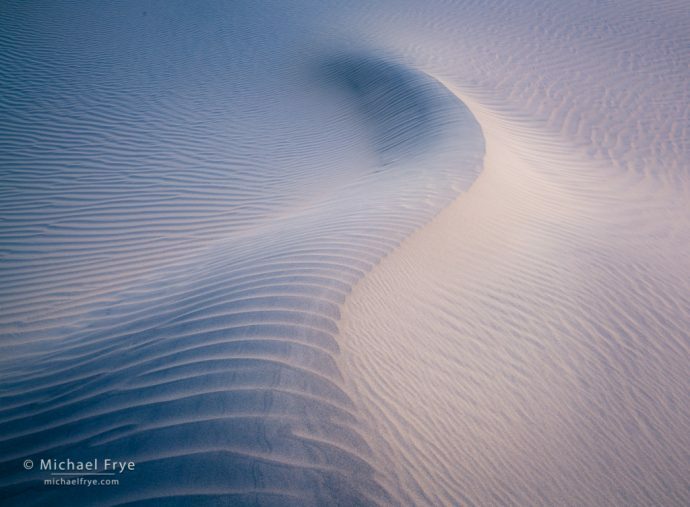 That approach never really works anywhere, but it definitely doesn’t work in the dunes, where you’re surrounded by the “subject.” Instead, you have to see abstractly. You have to look for designs. You have to find lines, shapes, patterns, and textures, and build compositions that emphasize those elements. This ability to see abstractly is one of the most important compositional skills you can develop. I believe that the less you think in terms of subjects, and the more you think about lines, shapes, and patterns, the better your compositions will be. It’s not that subjects aren’t important. They are. Subjects and their symbolism give the photograph meaning, and help tell a story. But you can tell that story more effectively when you arrange the elements of the scene into a coherent design with clarity, rhythm, and visual flow. And that requires seeing abstractly – looking beyond the mental concept of a tree, or mountain, or dune, seeing the actual lines, shapes, and patterns that these objects form, and then arranging those lines and shapes into a clear, cohesive, rhythmic design. 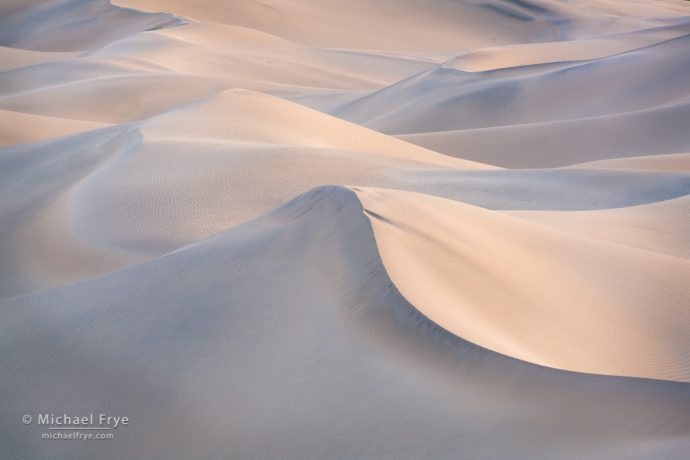 Dunes, with all their curves and textures, are one of the best places to practice this kind of seeing. But you can do this anywhere – in a forest, in a city, or even in your living room. 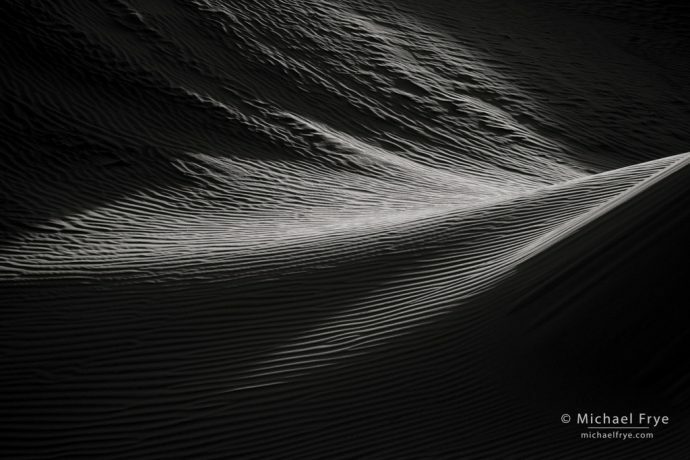 Here are some dune abstracts from trips to Death Valley last year and last month that I haven’t had a chance to post yet. In every case I was trying to see abstractly and make a photograph with an interesting design. 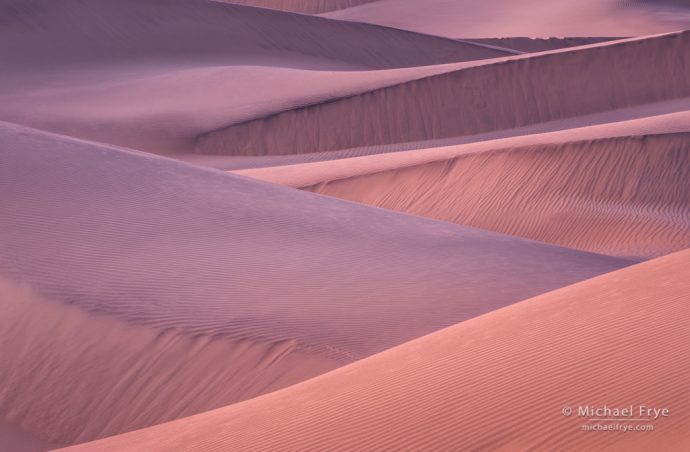 In these images the subject isn’t really the dunes; it’s the lines, shapes, forms, textures, and colors of the sand. 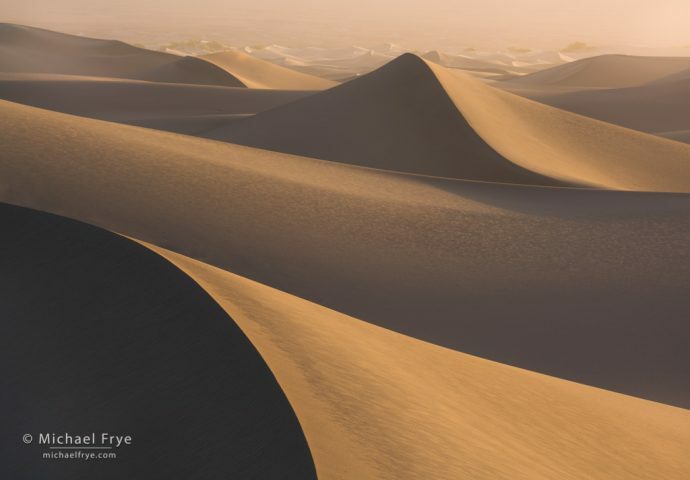 Oh, this last one, “Dune forms” is very nice. Thank you so much for sharing your talent with us. Everyone should have the experience of seeing beauty in their daily lives. Some times it doesn’t seem possible but then I see one of your pictures you have shared, and oh my goodness that is beautiful and it enriches my life. Thank you. You have to hike a bit. Beautiful work and very talented. Looking forward to following your blog. 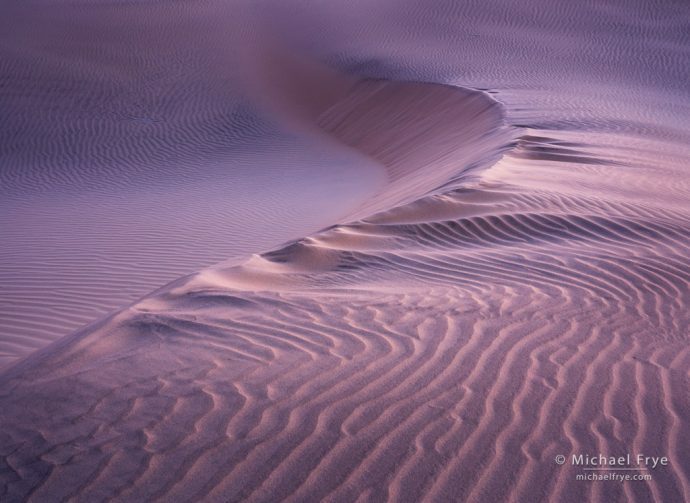 Stunningly creative in composition and light, Michael. Terrific work. Beautiful! I find it very challenging to find good compositions in the dunes; you really found some good ones. I’m curious what focal lengths you used. Thanks Carl. Everything from 35mm to 200mm. Can you guess which are the wide-angle images, and which are the telephoto shots? Beautiful images, Michael, many thanks. I’m spending more and more time lately using my 70-200 lens and looking for interesting abstract compositions. I just got back from a landscape photography workshop in England’s Lake District and the skies were so frequently overcast that this type of composition became important. All best to you. Thanks Bob. 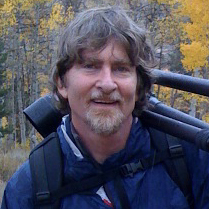 You bring up a good point about the relationship between light and focal length. When the light isn’t very interesting I tend to also focus on smaller subjects and scenes. Wide-angle views usually need some special light. I think it’s just as important to look for lines, shapes, and patterns in big landscape scenes as it is in more intimate views, but it’s probably easier to train your eye to look for those designs when you’re photographing smaller scenes. Amazing collection, Michael. I can tell you worked deliberately and looked around for what you wanted. If I had to pick a favorite it would be Ripples under a dusk sky. All the different lines and textures. Leading from left into the scene then diverting your eye from the main line with all the patterns that flow off it to the right. Then after your eyes have feasted on those, it leads you gracefully out the top and beyond, to infinity. It really caught my eye. 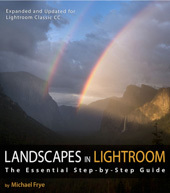 Thanks for sharing the photos and your knowledge. Amazing … simply amazing … as always. What a gift it is to see your work. Thank you for sharing. I am so great full to receive your beautiful and artistic landscape photograph.